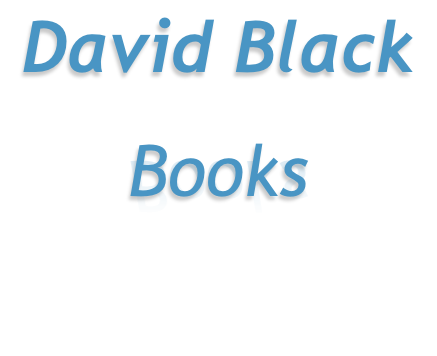 From here, you can review all David’s current books, and see what he is currently working on. You can also link direct to Amazon, to purchase any of his books, in Kindle format, and paperback too. David is keen to engage with his readers and hear from you, the reader. If you have any comments or ideas, please use the Contact button to send your message. What made David join the SAS? When best-selling author David Black was a young man he took a slug in the eye and it seemed his military career was over... or was it? He began to rebuild his shattered life by taking a most extreme road to salvation...The British army's reserve SAS Regiment's selection! With a 90% failure rate, did David set the bar too high? Had he embarked on an impossible quest? Join him on the barren and unforgiving mountains of south Wales, and see for yourself what the elite SAS demanded of him and what he endured in this true and quite amazing story. David Black served in the British army for more than 15 years. From the ugly, war-weary streets of Londonderry in the early 1970's, to the ranks of a Territorial regiment of the now famous Special Air Service, until the mid eighties. When not serving part-time with the Regiment, he worked as a fully qualified London black cab driver. Because of the security implications with the S.A.S., David has waited for years before writing anything about his many military adventures. Names have been changed, because even now, ex-members of the Regiment (and their families) are potential targets for the more rabid elements of the terrorist world. David holds many memories of life and experiences in the British army and particularly the Special Air Service regiment; happy, sad, funny, outrageous and sometimes, downright dangerous. His first book - Playing for England - covers his early military years, and culminates with a detailed look at his S.AS Selection and Continuation training course. 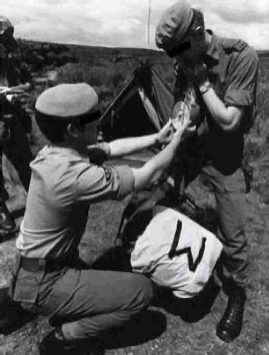 During two years spent as an instructor on Training Wing, David Black (crouching) and an SAS colleague check the 40 lb weight of a selection recruit’s backpack, during the final stage of reserve SAS selection. It’s instant failure if the pack comes up under weight. The recruit (on left) can be seen checking his map and compass for the next leg of the final navigation exercise, across the unforgiving wilderness of the Brecon Beacons. The recruit is undergoing his ultimate selection test; the infamous Long-Drag speed march, where recruits must, weighed down with weapons and heavy equipment, traverse over 40 kilometres of mountains, valleys and arduous moon-grass country in under 24-hours, to pass the first stage of Territorial SAS selection.